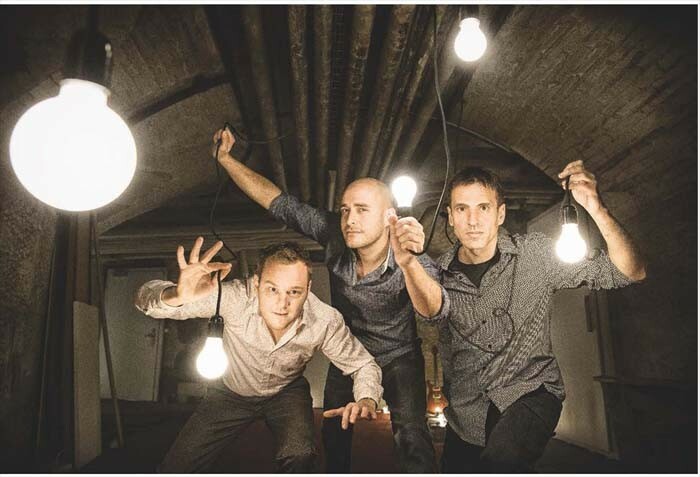 The Swiss-Austrian Trio Rom Schaerer Eberle brings unusual energy to stage. A jazz concert at Ginoza Culture Center Garaman Hall this Monday, the Columbus Day and a Japanese national holiday, features an extraordinary trio composed of a singer, guitar player and trumpeter. The trio, regarded as being on the top of the Concurrent European jazz scene features a Swiss-born singer, composer and performer, Andreas Schaerer, who is credited as mastering an extraordinary repertoire of vocal techniques, including an expressionist style between singing and speaking, sound imitation, beat boxing and scatting, right up to operatic coloratura. During his career he has performed in countries across Europe, Russia, China and South Africa. Along the way he has won several prestigious awards and became one of the top jazz performers for the Swiss Arts Coucil, Pro Helvetia. Guitarist Peter Rom is the co-founder of Jazz Werkstatt Wien and a graduate of the Berklee College of Music. He is a guitarist that is said to possess and endless storage of energy that manages to create an impressive amount of excitement and variety of d=sounds. The third member of the trio, Martin Eberle, plays trumpet and flugelhorn. He is recognized for his trumpet playing that is said to be as sensitive as it’s virtuosic. The performance will start at 6 p.m. with the doors opening an hour earlier. Tickets to the concert are ¥3,000 in advance and ¥3,500 at door. Student tickets cost ¥1,000. All seats are non-numbered. Two-day tickets covering both concerts are available for ¥5,000, but are limited to 100 tickets, on first some first served basis. Advance tickets can be bought through the Garaman Hall official web site (in Japanese) at http://garaman.jp/, 2. e-plus (in Japanese) at http://eplus.jp/sys/T1U37P0429040350 (Reserve at the website and pick-up at any FamilyMart or by phone 098-983-2613. Children under six years of age are not allowed and children of elementary school age and older must have a ticket. Care service for children is available for ¥500 yen per child but reservation must be made.